Arrive at the Site: 8:30-8:45 a.m. Lunch for Volunteers: Provided by event organizers. One of the rewarding ways in which ForColumbia serves its city is by partnering with non-profit organizations that are actively working to improve the lives of people in Columbia. The Safe Kids Coalition, led by the Missouri Department of Health/Senior Services, focuses on educating and equipping parents and caregivers to prevent childhood injuries. Their annual fundraising event, Safe Kids Day, is scheduled this year on April 28th, and is the primary way this non-profit raises funds that are used to provide free car seats, safety clinics and other services to low-income families. This is why we think your day will be well spent volunteering at Safe Kids Day. ForColumbia volunteers will work indoors and outdoors at this site, running various booths with games and other activities. Instructions will be given the day of the event. Families will be given the opportunity to participate in Safe Kids activities as part of their serving day. 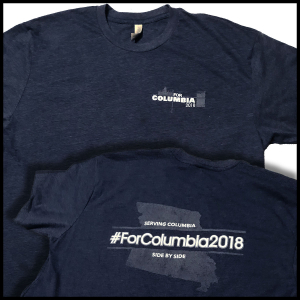 Volunteers serving at this event do not need to bring anything, but please be sure to wear your #ForColumbia2018 T-shirt! Yes, this is a great place to serve alongside your elementary-aged children!